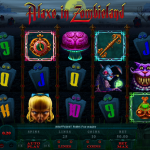 Alaxe in Zombieland is a gruesome looking video slot coming from Genesis Gaming, but can be found across Microgaming’s Quickfire platform. As the name suggests the game theme comes from the popular tale of Alice in Wonderland, but with a Halloween touch. The symbols from the tale have all turned to zombies and are terrorizing the land. But still, zombies or not, they always have time for a small tea party. The slot has great symbol details and an overall dark tone which flows perfectly with the slot theme. Beside the great visual effects Alaxe in Zombieland also has several bonus features which are guaranteed to keep your attention to the reels. The slot has three different scatter symbols and each one triggers the corresponding bonus feature. The Clock scatter will trigger the Tea party bonus if three of them land on reels 1, 2 and 3. 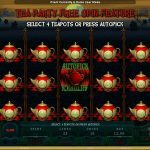 In this feature you will need to pick teapots, each one awarding free spins and multipliers. The Red Queen Adventure Bonus is triggered with 3 Scattered Keys on reels 2, 3 and 4. This is a cash bonus game where you need to make picks among Tombstones and White Roses, with the Red Queen awarding a win multiplier in the end. which Gravestones Alaxe will slash, each one awarding a cash prize or the collect sign. 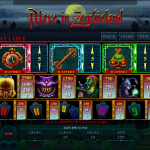 Alaxe in Zombieland is the perfect slot to play for the Halloween holidays. The designers from Microgaming and Genesis Gaming did a good job with the game, incorporating great visual effects and attractive bonus features. If you like adventures then you should consider playing Age Of Discovery a 5 reel slot by MicroGaming.